Dover sole in a crisp beer batter, served with homemade chips and curry sauce. For the curry sauce, heat a large frying pan until hot, add the butter, onion and chillies and cook for 10 minutes, or until golden-brown and softened. Add the plain flour and curry powder and cook for a couple of minutes. Add the cream and chicken stock, return to a simmer and cook for 5-10 minutes. Season, to taste, with salt and freshly ground black pepper. Stir through the coriander and finish with the lemon juice. 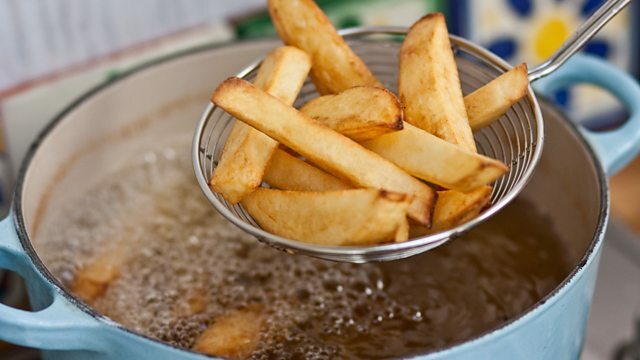 For the fish and chips, preheat a deep-fat fryer to 190C/375F. (CAUTION: Hot oil can be dangerous. Do not leave unattended). Meanwhile, sprinkle the yeast and sugar into a mixing bowl. Pour over the beer and vinegar and whisk in the flour and salt. Leave to ferment – it is ready to use when the mixture starts to bubble. Dip the sole fillets into the batter and deep fry until golden-brown and cooked through – about 3-4 minutes. Remove with a slotted spoon and drain on kitchen paper. Serve the fish and chips on serving plates with the curry sauce in a jug. Pour the sauce over the fish and chips just before serving.